Steampunk magnifying glass to see the invisible. Materials: glass, cardboard, plastic and paint. Beautiful craftmanship and painting! 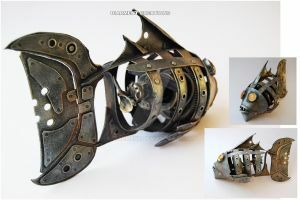 Very cool steampunk work you do. If you don't mind me asking, do you sell any of these? Awesome work btw! very beautiful! i like that you think about different accessoires. i must confess that i am really bored by yet another beautiful lady with yet another steampunk blaster (well, i had my own blaster-pictures in the beginning, i confess!) and i would love to see more stylish and innovative thing like this in pictures! Hi Indirie, I also try not to get bored, and I'm trying new ideas and textures, good to see you again. SO do you sell any of these items and if so , whats the rates? Im really into your clocks and notebooks, IM a tattoo artist and i would love a portfolio cover with your design to it and im sure ALOT OF TATTOOist would love to display there works in a portfolio with such an amazing and detailed cover showcase! I'm glad you like my work, thanks. Thanks, I use a magnifying glass, and I thought it was too common, so I built a new design. I love it buddy! !Excellant peice!! Now that's just gorgeous work! Wow... fantastic. I've been watching your page for a while, and one thing I've always wondered. How durable are your pieces? I know many of them have cardboard in their design, are those that do durable enough to be "used" or are they merely for display? Most of the process is constructed with hard cardboard, hardened with glue and acrylic paint waterproof. awesome work wouldn't the writing in be bigger? I thought the magnifying glass by itself couldn't be anymore iconic but then this came along. I really love this. It's so awesome! Wow, your creations are getting more and more awesome! Thank you! and I'm glad you follow them watching.